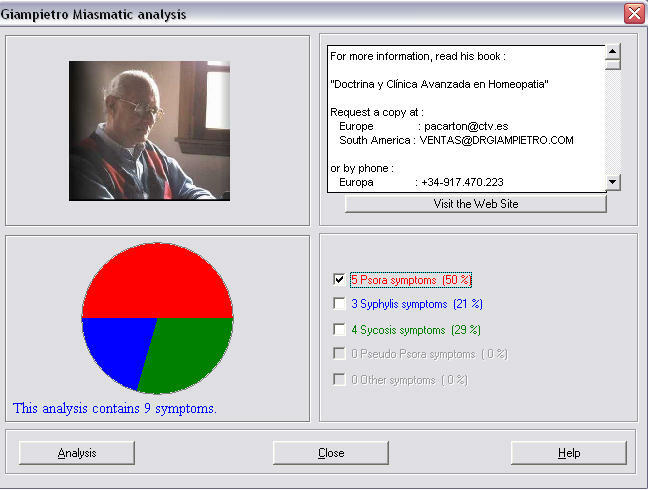 Dr. Giampietro (Argentina) has labeled the most important symptoms with miasmatic flags. These are available in Synthesis Treasure Edition in English and in German and in the Spanish Synthesis 8.0. As a result, once you make the analysis, you will see a pie chart showing you the miasmatic preponderance of the symptoms you took (e.g. red for psora). You select the miasm you desire and only the symptoms pertaining to that miams will be repertorized. 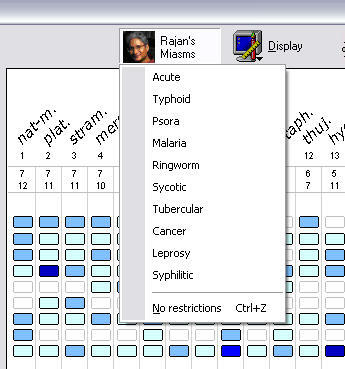 Radar 10 comes with an updated version of Dr. Rajan Sankaran's (India) miasmatic remedy groups, according to the latest version of the Schema. You can use these filters more easily now as a separate "Rajan's Miasms" button has been created in the analysis screen (see picture at the right).